Spooky Floral Designs for Halloween! With Halloween fast approaching, we know there’ll be plenty of ghostly parties taking place at the end of this month! So, why not add a bit more panache to your spooky event, by including some attention-grabbing spooky-themed Halloween flowers? 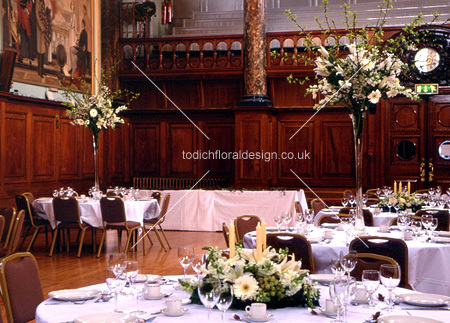 London florist Todich Floral Designs are one of the few specialist events and party florists operating in the Greater London area. 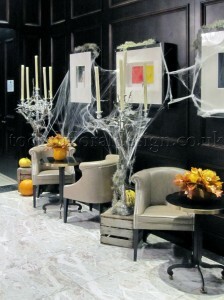 Parties and special events for occasions like Halloween are where our skills as floral innovators can really come alive! Black tulips, pineapple leaves, Grevillea, Bacarra roses and twisted willows can all create eerie-looking floral displays; perfect for adding a more sinister feel to your venue! 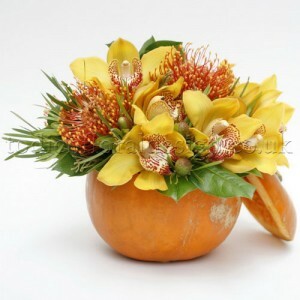 But, if that all sounds a little too dark for your liking, why not opt for a mixture of bright orange and yellow flowers, skilfully arranged inside a large hollow pumpkin? Your guests will love them – not only will they look gorgeous – they’ll also fill the room with sumptuous aromas! We can offer a FREE consultation at a location of your choice where advice will be given on Halloween flower decorations, style and designs that will suit you and your event. We also provide a London/ UK delivery, delivery on weekends as well as a free professional installation service. We have provided stunning displays at some of London’s top venues, including: Café Royal, Mandarin Oriental Hotel, National Portrait Gallery and many more. So, whether you need beautiful Halloween flowers and gifts for a sit-down meal or creepy-looking floral designs to really wow your guests – we are here to help you! And, what’s more, our prices aren’t terrifying either! Our bespoken design and excellent service is competitive and honestly priced. For more information on our the best Halloween flowers, Halloween flower delivery or Halloweeen wedding bouquets call 020 7737 1166 and speak with one of our friendly members of staff. If you are looking for haloween flowers for an event in London then Todich Floral Design may be the perfect florist for you, the specilist company design Halloween flower arrangements, Halloween wedding centerpieces and Halloween bouquets. 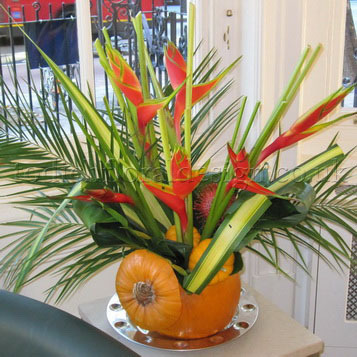 Using an assortment of sundries, fruit and cut flowers, the company make Halloween flowers and gifts for the special event on a yearly basis. Our florists at Todich Floral Design recently got the chance to design beautiful contemporary event flower arrangements for a private event that was being held in St John’s Wood, London. The private party was located in a stylish roof-top apartment which had breath-taking views of London. The event included high-profile guests and the host wished for us to provide flower displays to decorate the entire venue. 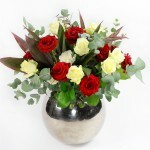 The host has been a regular client of our flower shop in London for the last 10 years. 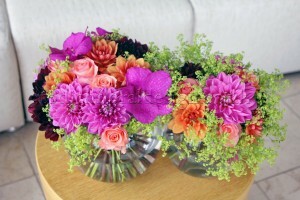 The client always requests the London florist to provide flower arrangements for all of her London events. The main focal point at the venue was the buffet table; this required a stylish long and low flower arrangement that matched with the overall colour scheme and style of the room. Our florists created a beautiful event floral design in vibrant reds, magentas, and whites. The flower display was to be placed onto a red table cloth which was surrounded by red tea light candles. 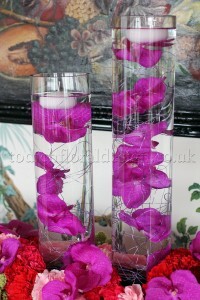 The event flower arrangement sat at 120cm long and had four tall glass vases with submerged pink/purple Vanda orchids. White floating candles were placed at the top of the vases and were to be lit during the London event. 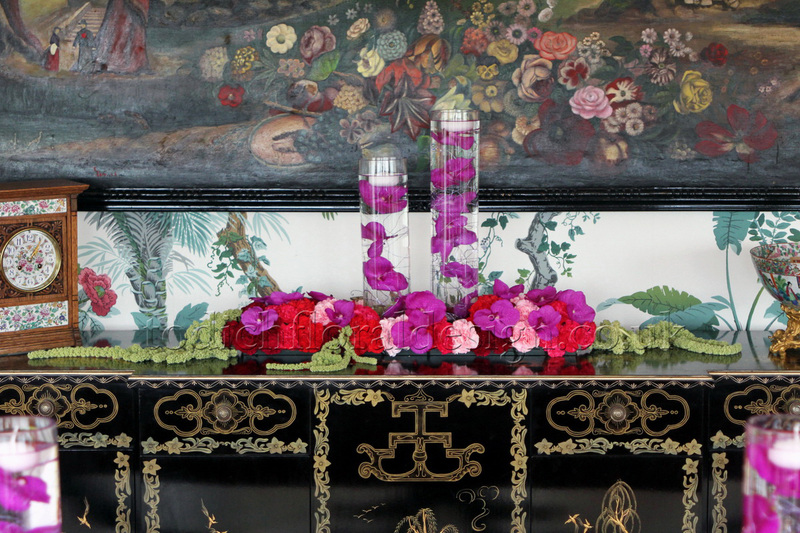 The vases were sat within a bed of red, pink, burgundy and cerise carnations. We made sure the vases had different heights so to create maximum impact. We designed a mantelpiece arrangement which was placed next to the buffet table; the mantelpiece flower arrangement was similar but a smaller event flower design of the main flower display. 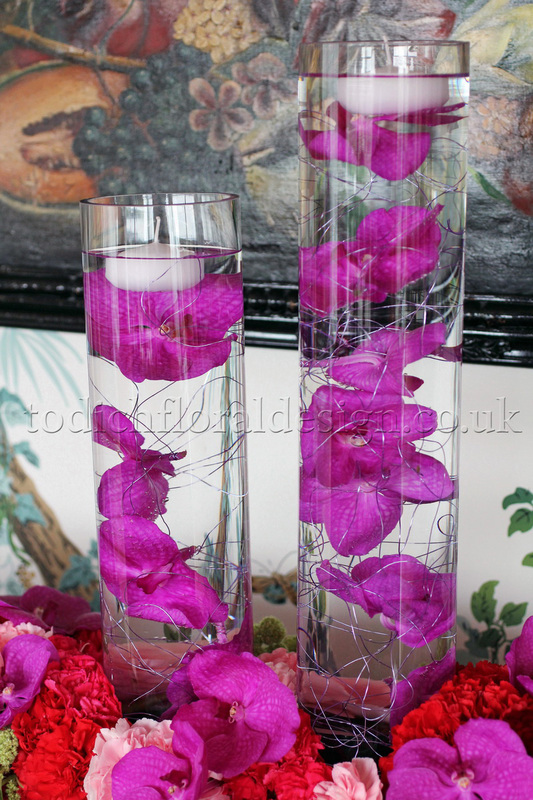 It included vases with submerged Vanda orchids which were in a bed of red, pink, burgundy and cerise carnations; the flowers look beautiful against the floral wallpaper. The host required a tall flower display for the entrance hall. We kept the colours and the flowers consistent throughout. 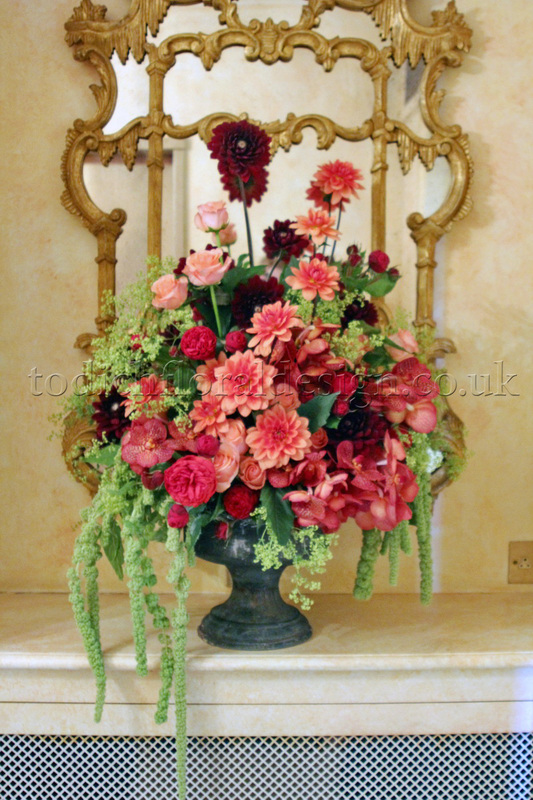 The arrangement was a front facing design including red and orange dahlias, peach roses and alchemilla. 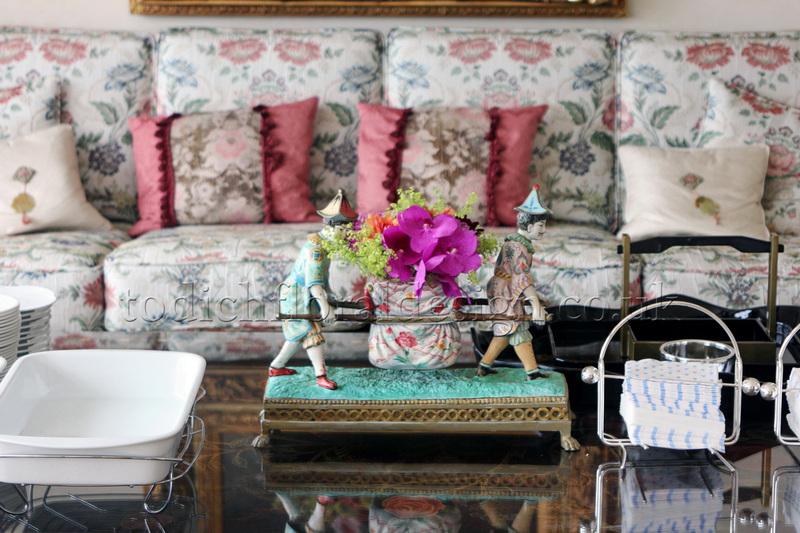 We also designed an orchid plant arrangement which was framed by seasonal flowers. We placed the orchid into a glass vase and arranged red and orange dahlias as well as peach roses around some seasonal foliage. The upstairs room had a small bar and coffee table which required small flower arrangements. We stylistically arranged pink Vanda orchids, orange dahlias, yellow dahlias and green alchemillas into fishbowl vases. The exotic private event flowers were styled into a contemporary design and looked absolutely stunning! 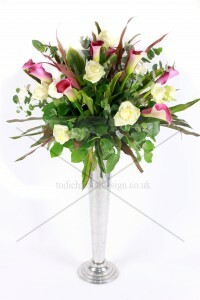 We are also thrilled our client loved the flower designs too. 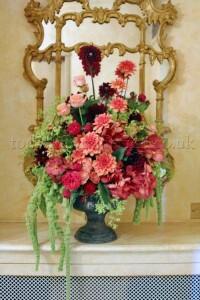 Todich Floral Design specialises in providing private event flowers for London corporate parties. The award winning florist offers bespoke event flower designs which are created by the talented floral team. Todich Floral Design are already preparing for Christmas. 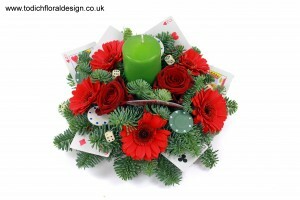 The florist company are ready to design beautiful Christmas flower arrangements with Christmas trees. 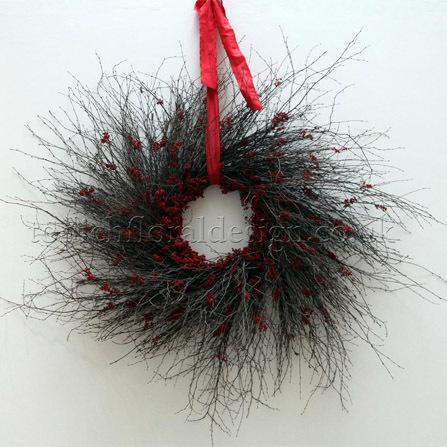 The London florist love to mix Christmas flowers with Christmas decorations. Take a look at our Christmas portfolio of designs. 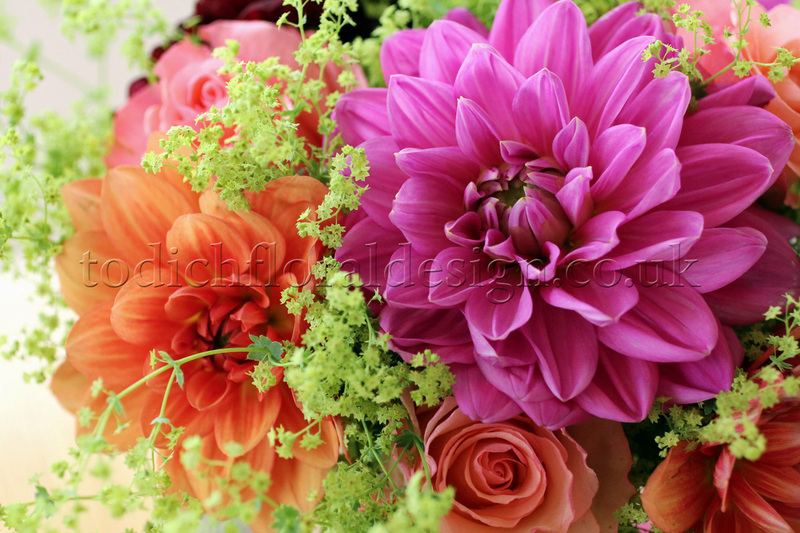 The team at Todich Floral Design love learning something new. The consultants get many requests for cultural event flowers. The team work closely with the client to make sure the flowers are perfect for their specific needs. Take a look at our other London cultural flower arrangements. asked to create unique floral displays for a Venetian Masquerade themed event we jumped at the chance. 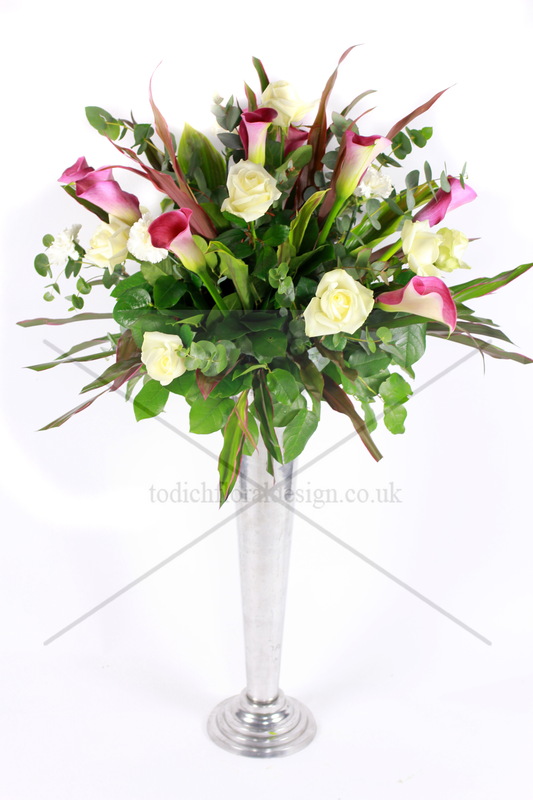 Our florists at Todich floral design love a challenge; we excel at designing new arrangements and thinking up unique and often exquisite designs. Our requirement for this event was to match the colour tones of the two rooms at the venue. One room was decorated with deep rich colours of reds and purples, whilst the other was decorated with deep reds and whites. Our aim was to create flower displays that coordinated with the room’s décor and yet created a romantic sultry atmosphere. Our consultants visited the hotel and researched into the Venetian masquerade theme, they created a mood board of colours which allowed us to establish ideas for the perfect style of flowers to complement a Venetian Masquerade Event. We were asked to create designs for a total of 12 grand arrangements, this of which had to be divided into two colour themes to match with the two rooms of the venue. The first room we designed magnificent displays of deep red Naomi roses, contrasting purple calla lilies and scented purple freesias, with these mixed tones of colours we fashioned the floral displays to scream vibrance and elegance and create a maximum impact throughout the whole venue. In the second room we created impressive displays of vivid purple calla lilies, snow white roses and a hint of white carnations to balance the colour of the arrangements. 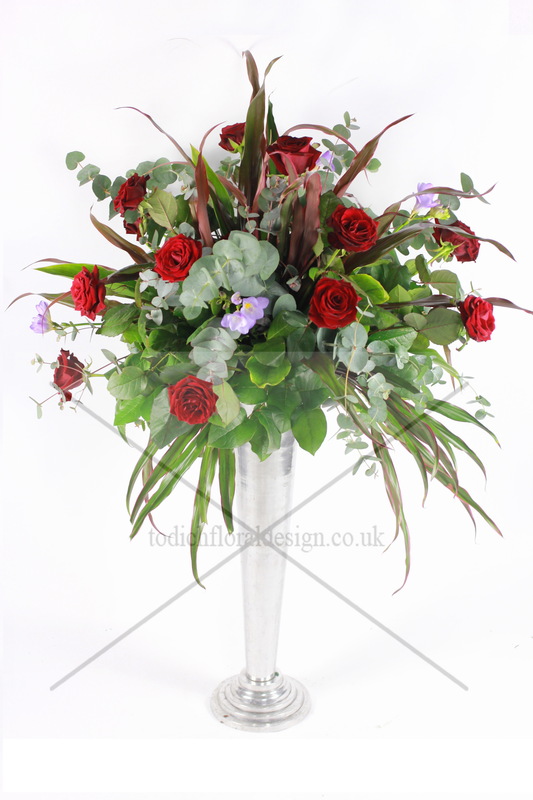 All the flowers were arranged with burgundy cordyline leaves, green salal and scented eucalyptus leaves. The mix of deep reds, purples and the balancing of snow white flowers looked stunning up against the backdrop the venue. The flower heads are all small but striking and packed a punch of colour at the event. The event was a success and we were very happy with the results. It’s your perfect day and you want it to go well. How can you ensure your whole wedding is going to run smoothly from start to finish? OK – unfortunately, we can’t tell you that, but what we can tell you are some safe steps in ensuring the floristry side goes well. Here is a handy list of how you can prepare for your wedding flowers to be perfect on the day. 1) Congratulations! As soon as you have secured a date for the wedding, call or email your selected florists and ensure the date is available. Tips on selecting a florist – firstly, make sure you have seen pictures of their previous weddings and other event work. It is good to gain confidence in a florist, which can also be done by asking what they have done previously – ask about what contracts they fulfill with hotels, offices and restaurants. Generally, if they can supply to a 5 star hotel on a contractual basis, you are safe to assume they can carry out your wedding to meet your precise requirements! 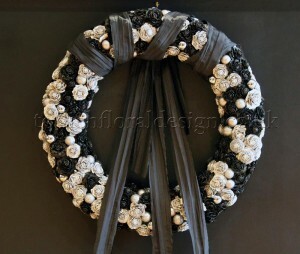 Secondly, make sure your florist has experience dealing with your culture of wedding. 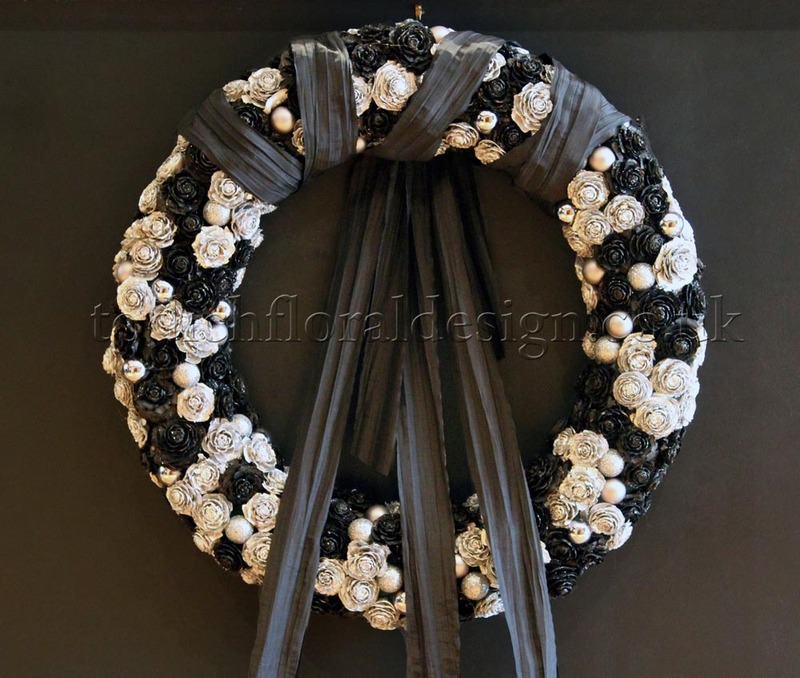 In Britain, it is generally safe to assume your florist has handled Christian weddings before. But have they handled Persian or Chinese weddings? Best to ask (We have! Amongst several other cultures – Have a look here for our others). You don’t want to spend 3 hours explaining what the Sofreh Aghd is, only to find it’s done wrong! 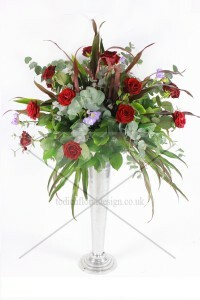 2) Make sure what your florist charges is good value for money! Especially important in an economic downturn is knowing that your money is going the full mile. Not to blow our own horn here, but for example, we operate from a warehouse instead of a high-street shop. This means we’re not blasting thousands of pounds a year on rental fees – if we were, those fees would inevitably be passed onto you as the customer. 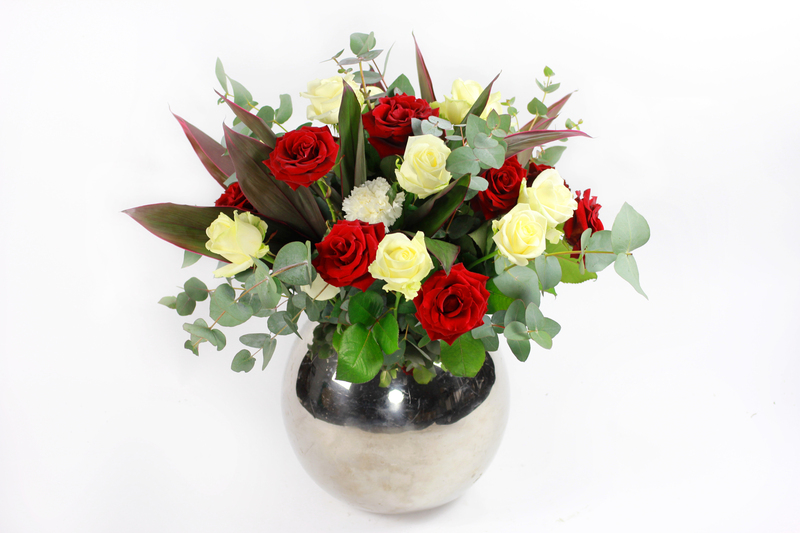 3) You’ll probably have your initial colour schemes in mind – discuss with your florist your chosen colour scheme and particular choice in flowers if you have a specific variety in mind – while most flowers are generally available all year round, it is important to consider the seasonality as this can raise the budget dearly if your selected flowers are out of season. 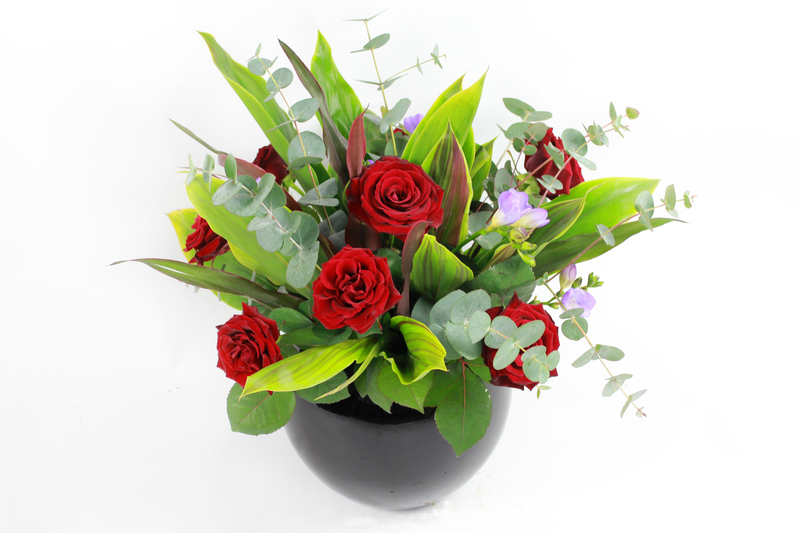 If you’re not sure at all, contact your florist for some advice on the phone or arrange a face to face consultation. 4) Think carefully where you want flowers placed – besides the standard bridal bouquet and buttonholes, there are many aspects to consider – almost every surface can be decorated with flowers and it is up to you (with advice from your florist of course) where you want these to go. The possibilities are limitless – from table centre arrangements, candelabra’s and chair back bouquets, to buffet table displays’ and reception entrance decorations. You can even get everything from your dress and your shoes made in flowers! This is where your budget will start skyrocketing – stay safe and realistic with our guideline downloadable pricelist. It is also important to consider the size of each arrangement as it can vary massively in the minds of different people (for example, our picture at the top has two sizes of table arrangements and also two very different budgets!). Also consider the number of people attending – how many buttonholes and bridesmaids bouquets will you require and how many table arrangements and thank you bouquets will be required? 5) Contact your florist to let them know precisely what types of locations you want to fill (and make sure they can do it in the case of the dress and shoes made with flowers!). This is probably the best time to arrange a face to face meeting with your florist. 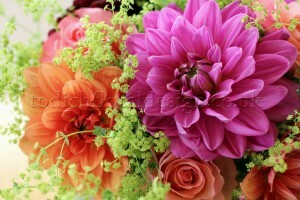 Here, you can discuss your colour scheme, flower choice and types of floral decorations you require in further depth. 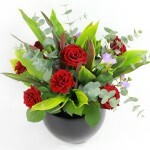 The florist should then provide you with a comprehensive quotation. Once you’ve agreed to this you can relax! The florist will take it all from here and contact you if and when necessary. We’re very happy and honoured to have been given the chance to decorate a small royal event at end of July, a dinner at the Westbury Hotel, with Prince (and princess) Michael of Kent as guests of honour. Our part of the job was to create a formal but private atmosphere, befitting the presence of such extinguished individuals. The event was decorated with table arrangements and standing arrangements in four niches. This was a great experience, where our professional approach was shown in full light. We were very excited and nervous at the same time – expectations were high, but luckily our experience and expertise helped us hit the target dead center. Private events are great occasions for strengthening bonds between friends, family, business partners, employees. This very broad category of events allows many different approaches in organising. Whichever way you choose to organise your private event, it’s good to have at least some idea as to what things you need to consider before you delve into the deal. Here are a few things we think are common for any kind of private event. What’s the occasion? Are you celebrating someone or something or simply getting together for a good time? It’s good practice to give a private event specific meaning. For example, if you are organising a private event celebrating your parents 50th anniversary, than that should be the main topic, and the center of the event, at least for the first part of it (introductions, toasts, best wishes). After this, the event will take its own course, and transform into a more informal shape. This may seem like an obvious thing to do, but it’s surprising how many times people neglect this very important part of organising a private event. Depending on the intended size of the event and the occasion, you may want to make a selection of guests you will invite to this particular event. If the private event has a more formal character, or it has a business dimension, than picking the right people to invite will help keep the focus on the goal of getting together in the first place. What would be the best choice of location for the event? If you are considering your own space, make sure it can indeed accomodate the number of people you plan on inviting. Otherwise, a hired venue may be a better choice (many offer their clients exclusivity – for the right price of course). Make the location easy to get to (with proper instructions), and take into account whether you’d prefer low level exposure towards the public or no exposure at all. Even though you are organising a private event, there is no reason not to make it a bit festive by incorporating appropriate decorations. 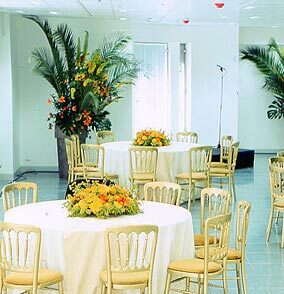 Floral decorations are always good, as they bring a little life to the space where the event is taking place. As these are details everyone will notice, we advise you hire a professional to do the job. Our services for private event decoration are always at your disposal. Food and refreshments are going to be the “background support” for your private event. Make sure you serve food that’s appropriate and that the service is good. These may seem like less important things, but no one forgets a bad taste in their mouth. Probably the best thing is to hire a good catering service, so ask your friends and colleagues for advice. Are you planning entertainment? Background music can be played from an appropriate sound system, but nothing beats live performance, so if you aim to have some relaxed fun, consider hiring a couple of musicians. When you’ve covered everything in the planning process, then and only then send out invitations. The last thing you need is to invite everyone, and then run into problems that may not be surpassable at the time. If you need advice or would like to find out how we can help you make your private event memorable, please don’t hesitate to contact us at any time.